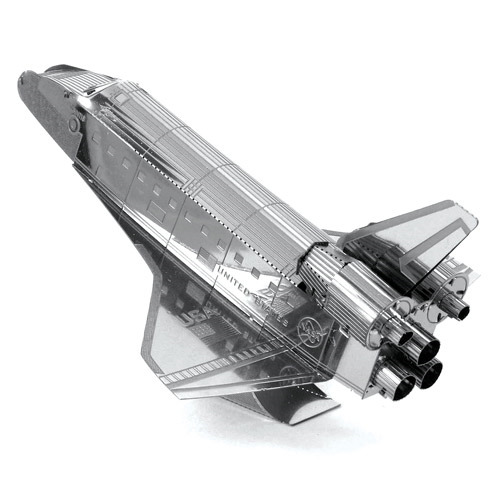 Assemble your own Space Shuttle with ease with the NASA Space Shuttle Endeavour Metal Earth Model Kit. Use the easy-to-follow instructions included with the sheet to pop out the pieces, bend the tabs, and connect them at the attachment points! When assembled measures about 3 9/10-inches wide x 2 7/10-inches long x 1 9/10-inches tall. The Space Shuttle Endeavour is one of the retired orbiters of the Space Shuttle program of NASA, the space agency of the United States. Endeavour was the fifth and final spaceworthy NASA space shuttle to be built, and first flew in May 1992 on mission STS-49 and its last mission STS-134 was in May 2011. Ages 14 and up.